Today we have launched new Home Page Layout on Crunchify. It’s based on Grid Layout. This tutorial will help you on how to Create a Grid Layout with Genesis Themes. As you see on home page, it has only 1st post as a featured post with content length 300. Remaining 8 posts on Home page is in Grid Layout. This tutorial will help you achieve exactly same layout for your child theme. 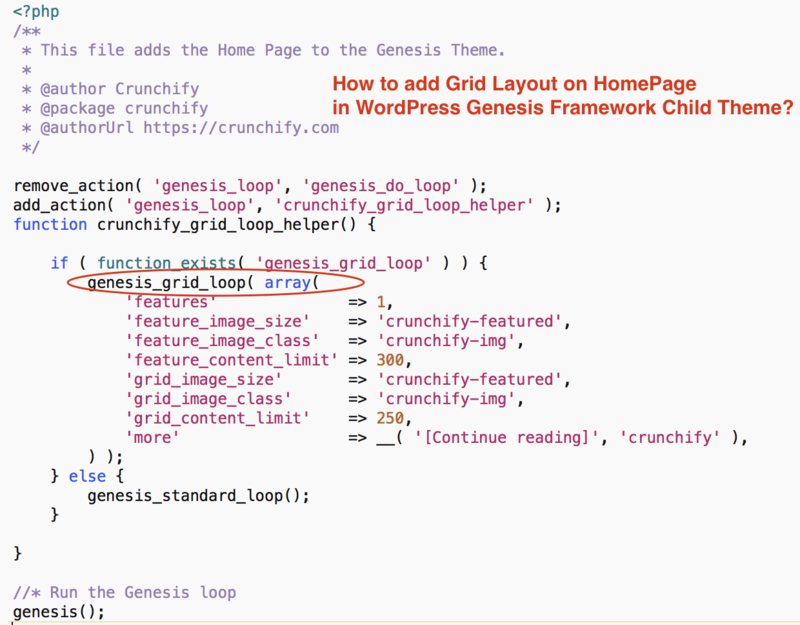 You will be able to add Grid View on HomePage in Genesis Framework. Open text editor and put below code. Save file as home.php or front-page.php. For me it’s front-page.php. * This file adds the Home Page to the Genesis Theme. Put file into your child theme’s root folder at the same location as your style.css and functions.php file. Open style.css file and add below CSS code. This CSS will add Grid layout on your home page. 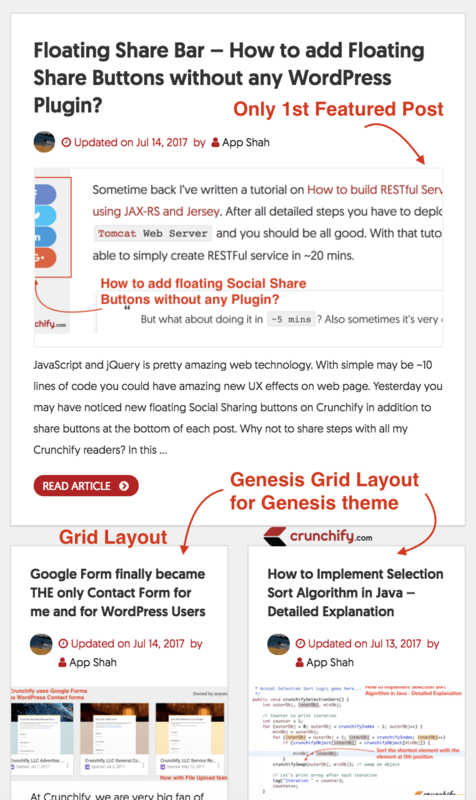 Clean your site cache and browser cache and reload your page to see updated new layout for your Genesis WordPress Theme site. Here is a layout screenshot. Let me know if you have any questions and face any issue implementing this. Help is just a message away. Frontpage, I got 1 full post plus 4 small posts. Second page I got 5 small posts (leaving the last one hanging alone – uneven). How to make the second page 6 posts, or how to make the front page all small posts, no full post, so that all are even? The numeric button also doesn’t align properly on Parallax, but it does work on another theme. In order to have all posts same on front page, you have to update front-page.php file with features = 0. I followed this tutorial but it did not work for me. Please help! Hi Karan. What issue are you facing? What is your site and which GenesisWP theme are you using? Thanks App Shah for complete tutorial. Today I followed the same and it worked like a charm. Between I’ve to change my CSS little bit. You are welcome Patrick. Happy Blogging. Let me know if you have any questions on Genesis Framework Theme and configuration.